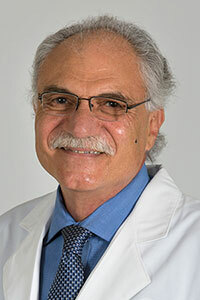 Ignatios S. Zairis, MD, PA, is a board-certified surgeon with a focus on thoracic surgery and special interests in the treatment of lung malignancies and the use of minimally invasive surgical methods, including robotic-assisted techniques. Since 1984, Dr. Zairis has been an attending physician at Holy Name Medical Center, where he is Chief of Thoracic Surgery. After earning his medical doctorate in Greece at the University of Athens, Dr. Zairis completed his internship and residency in general surgery at SUNY Downstate Medical Center in Brooklyn, where he achieved chief resident status. He completed his cardiothoracic surgery residency, also at SUNY Downstate, and was named chief resident of that program, as well. On the Top Doctor rolls of Castle Connolly Medical, Ltd., New York Magazine, New Jersey Monthly, US News & World Report and Newsday, Dr. Zairis is a member of the Bergen County Medical Society, the Hellenic Medical Society of New York, and the Brooklyn Surgical Society. Dr. Zairis speaks English and Greek. One of Dr. Zairis' special competencies is robotic-assisted lung cancer surgery, a minimally invasive method. Using robotic technology, he operates through small incisions in the chest to remove tumors, as well as some surrounding healthy tissue, from the affected area. He may also remove nearby lymph nodes to assess the extent to which a malignancy may have spread beyond the lung. Depending upon a patient's condition and the size and location of the tumor, Dr. Zairis may use robotics to treat patients with early stage cancers, as well as those who have already been treated with chemotherapy and/or radiation, which often improves a patient's candidacy for surgery. Robotic surgery offers advantages over other minimally invasive approaches and traditional open surgery. These benefits make the technique especially well-suited for operating in the confined space of the chest. Instruments used in robotic surgery bend and rotate to a degree exceeding that of the human hand, giving increased range of motion and dexterity, improving access to hard-to-reach areas and enhancing precision. A magnified, high-resolution 3-D camera gives the surgeon a superior view, even of areas that cannot be seen with the naked eye. Robotics improve the surgeon's ability to spare healthy tissue not impacted by cancer. Robotic surgery patients experience less pain and quicker healing, and are generally discharged earlier, as compared to those having undergone other surgical approaches. Dr. Zairis and his surgical team are committed to high quality, personalized attention, compassionate care, and the best possible outcomes for their patients.